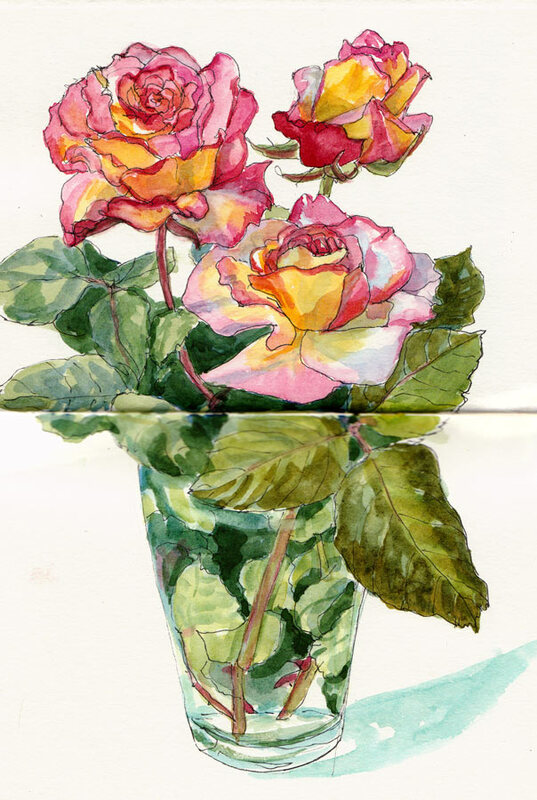 On a day that felt like a marathon of busyness I couldn’t resist pausing this afternoon to sketch roses from my favorite bush which was putting on a glorious show of snazzy blooms. I like that I can turn my journal sideways and paint across the centerfold to double the size of my “canvas,” but it’s a little sad and distracting having that strong fold line across the middle. I’d thought of painting on a sheet of watercolor paper instead of in my journal but I had the silly idea that there wasn’t time for that and anyway my journal was feeling a little neglected. I’ve spent the past couple of days catching up on non-art stuff, like cleaning the house from top to bottom, finally dealing with a pile of paper that needed filing or doing, and using the FURminator (best invention ever!) on my two cats, filling an entire empty Kleenex box with fur that would have been shed otherwise. I saved the big ball o’ fur, thinking it might be fun to use in an art project but haven’t figured out what yet. I love this – the way the muddle of stems and leaves within the vase blossom into those wonderful roses. Roses as gorgeous as ever!!! It’s beautiful and I don’t think it hurts to have the line through it. It just is. Because it’s where it is. Nothing more is expected of journals! I’m not saying it doesn’t deserve to be a painting in it’s own right, but that I’m happy to see it just like it is!